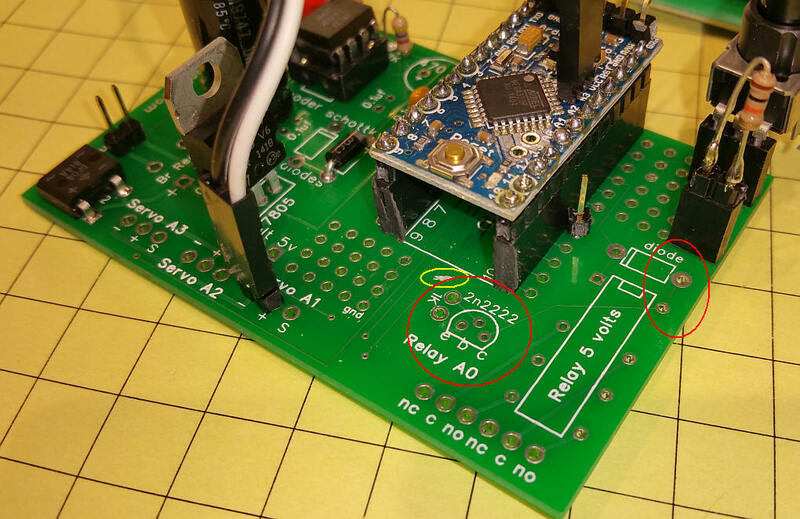 In addition to experimenting with DCC++ over the last few months I have been trying out different H-Bridges to see if there is one that would work with DCC++ while delivering more than the 1 to 2 amps that the standard Arduino Motor Shield provides. Such a option would a good option for G scale layouts that typically draw much more power than smaller scales. 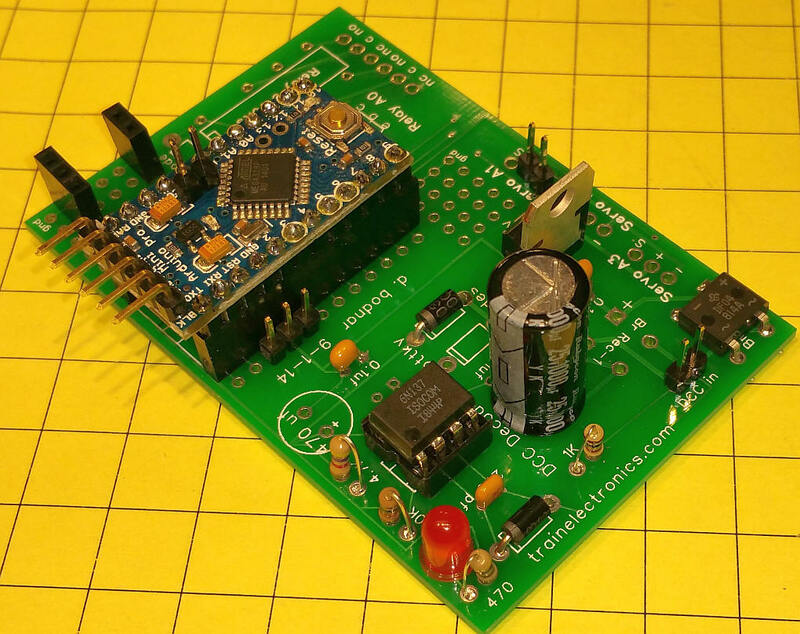 I came across a few higher power shields (that are described here: http://trainelectronics.com/DCC_Arduino/DCC++/) including one that has an advertised power capability of 43 amps. While I am a bit skeptical about this claim my tests show that it has no problem delivering 5 or more amps, more than enough for my purposes. 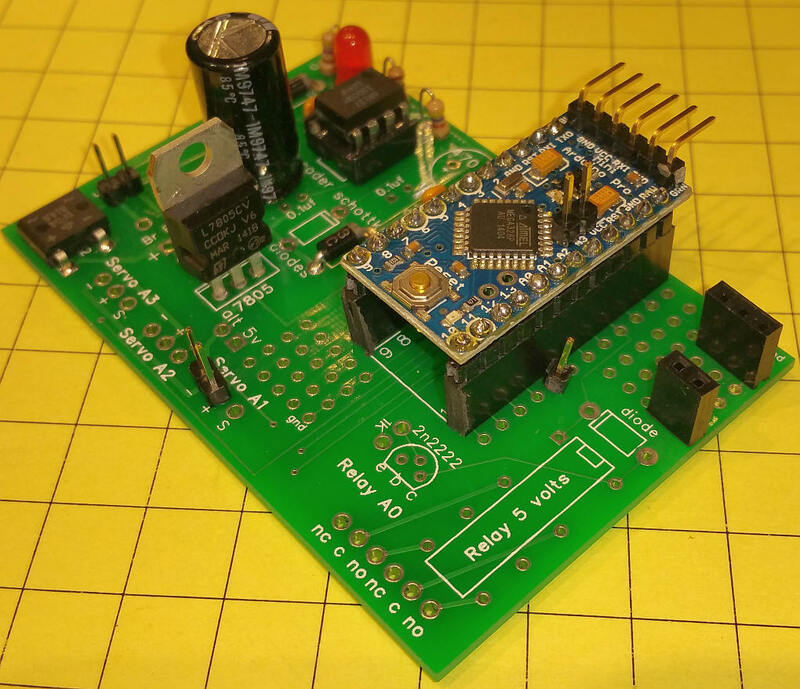 I describe how this can be interfaced to the DCC++ controller in the link above. 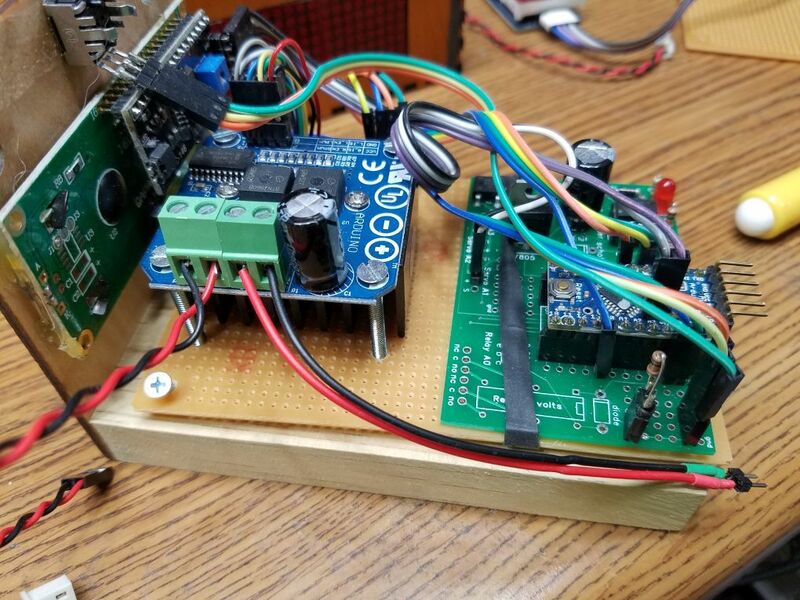 In order to make the use of this H-Bridge more convenient I decided to design a stand-alone DCC booster that would attach to a DCC signal and boost it before powering a track. 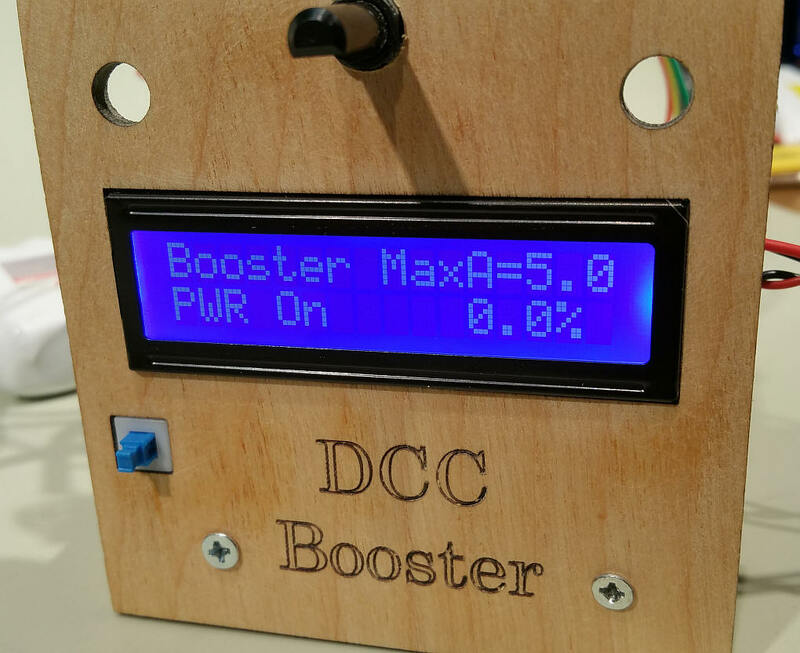 The booster is designed to work with DCC++, Digitrax and other systems. 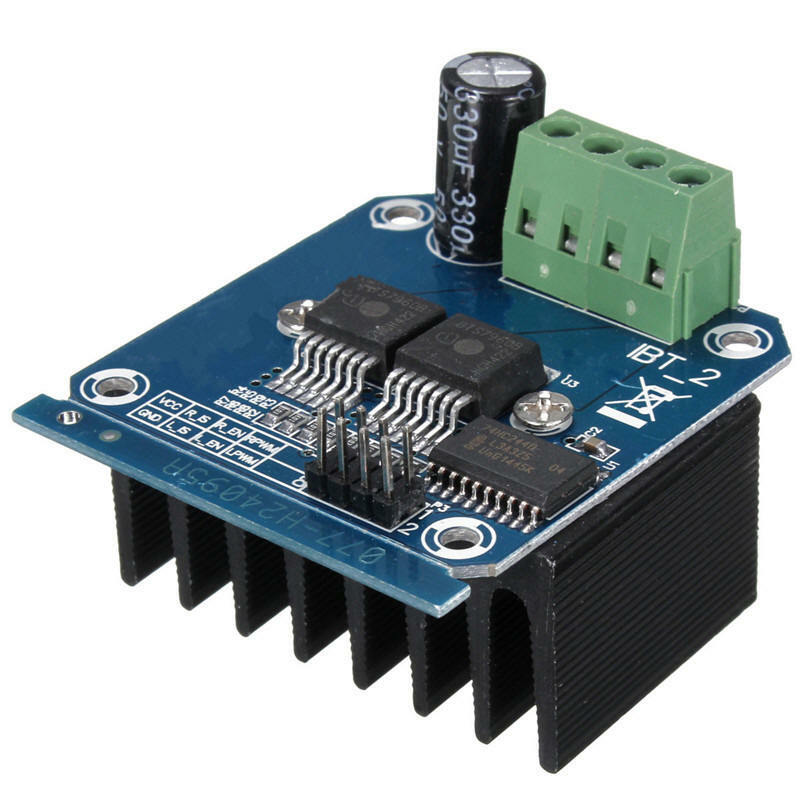 The H-Bridge is available from eBay, Amazon and other vendors - just search for "H-Bridge 43 amp BTS7960B". Make sure you get the unit that has two BTS7960B devices on it - each is 1/2 of an H-Bridge. 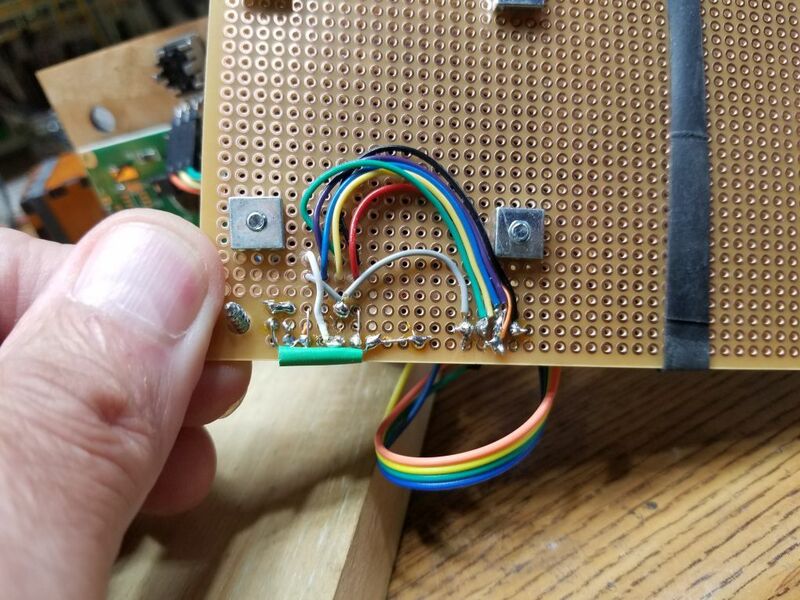 The control signals go to the 8 pins on the front and the power in and power out wires go to the 4 pin screw terminal connector at the rear. This H-Bridge and similar units do not operate on the single PWM signal that most DCC systems provide. 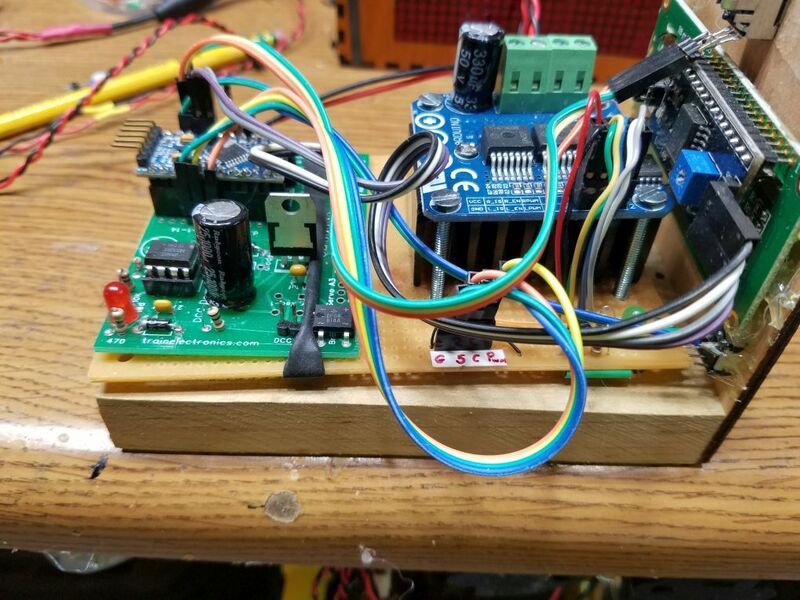 It needs a right hand rotating PWM and a left hand PWM. To change the single PWM signal to two a simple one transistor circuit is needed. That circuit can be seen in the lower left corner of the schematic (below). The H-Bridge can act as a DCC booster without much more than the Opto Coupler circuit (top left of the schematic) and the one transistor converter (lower left). The H-Bridge does hove an over current shutdown capability but it doesn't react until well over 30 amps are being drawn, way more than we are going to use. 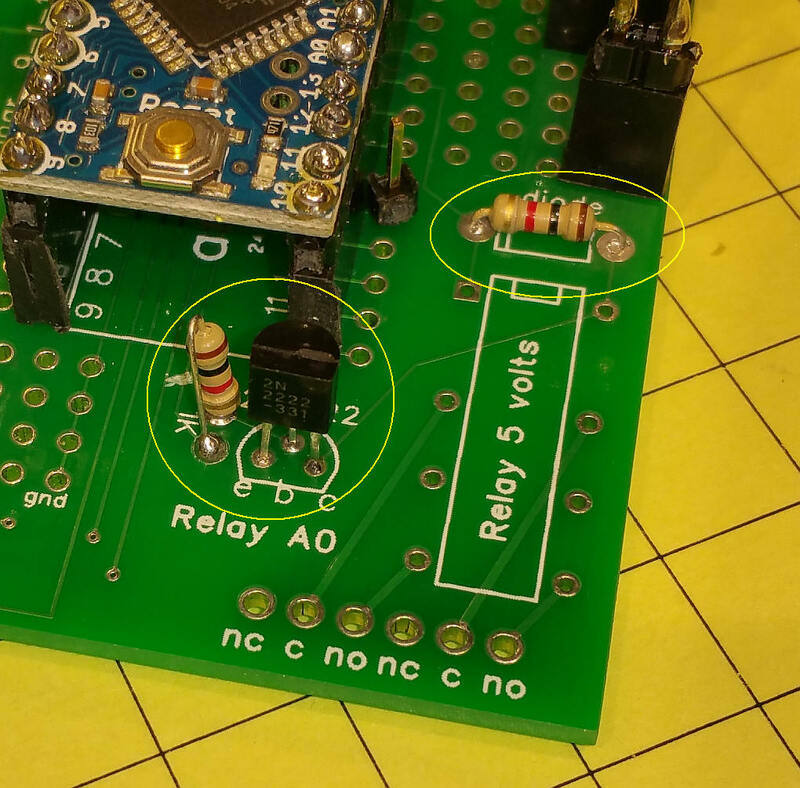 To get around this problem so that the system shuts down immediately if the track is shorted an Arduino Pro Mini has been added. 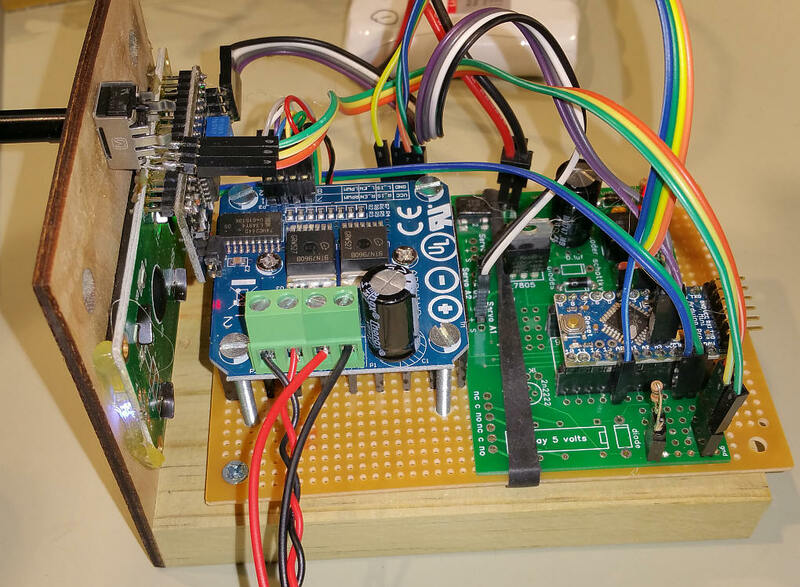 The Arduino monitors the current sensing pin on the H-Bridge and can turn it off should it detect a high reading. The unit shown in these photos was built on a circuit board that was originally designed as a DCC accessory decoder. It has most of the parts that are needed to make the booster. If you do use this board this trace needs to be cut. 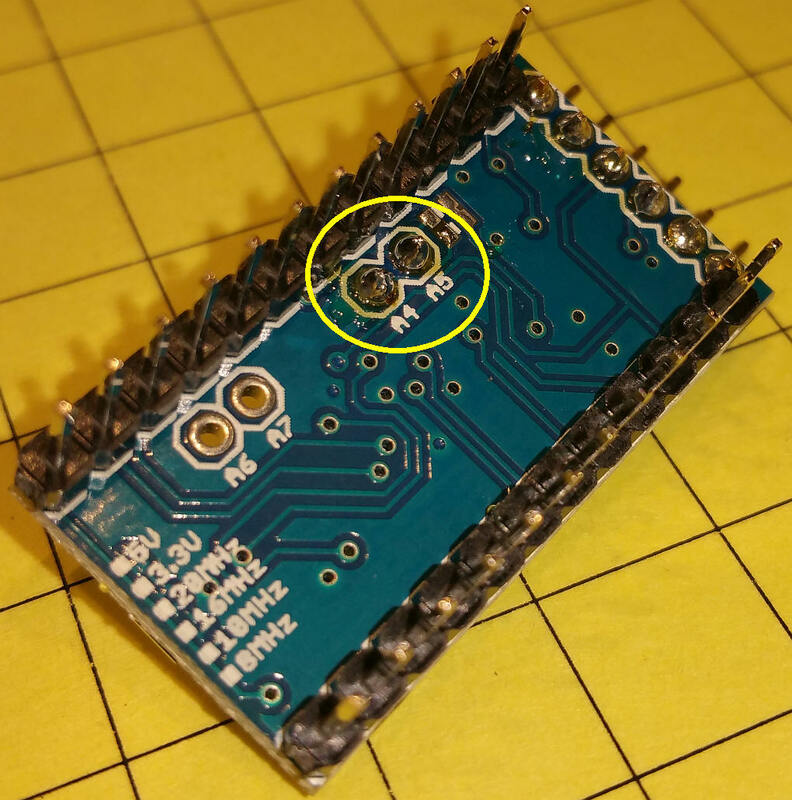 Note that two of the pins that are used by the I2C LCD display are not on the edge of the Arduino, but inside a few mm. Here is a rear view of the LCD pins. 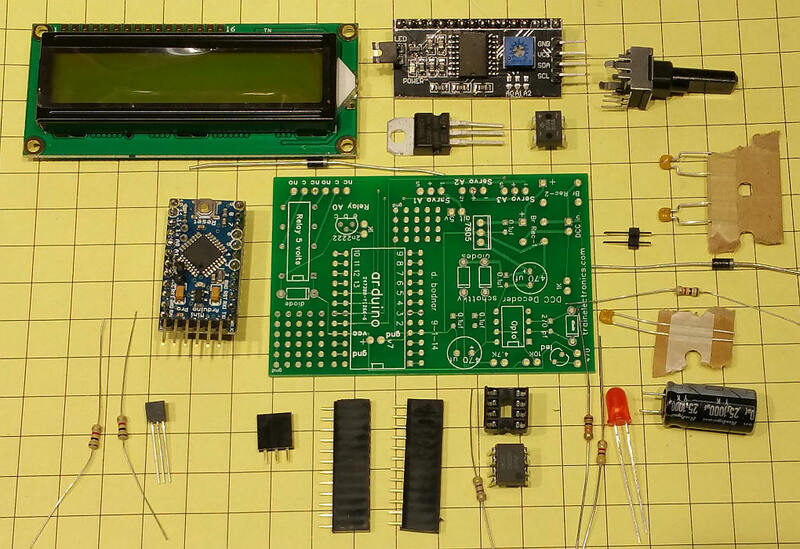 Here the board has most of the components installed. Note that a good many component areas are left unpopulated. Here the connections for the potentiometer are shown. 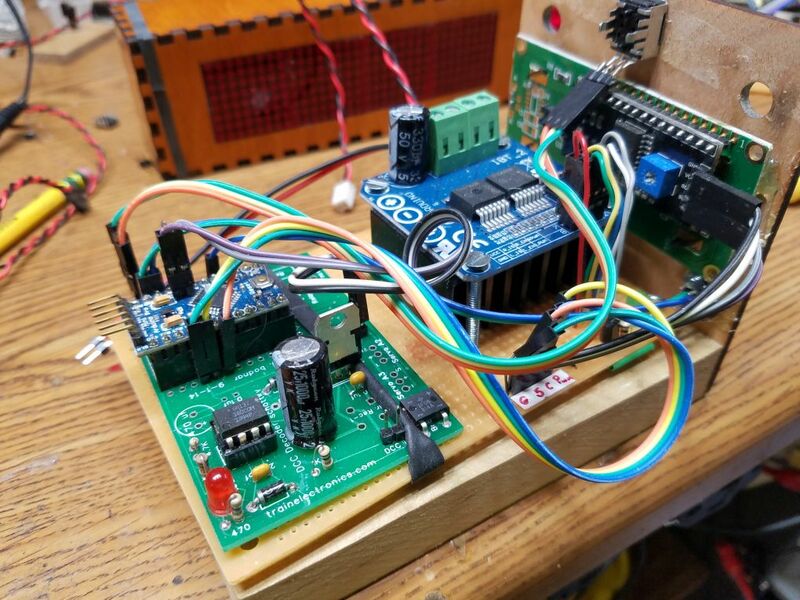 Here is the first test with the LCD display connected. There is space on the board to accommodate the transistor and two 1K resistors that are used to give the proper PWM signal to the H-Bridge. The areas used are circled in red. One trace needs to be cut. 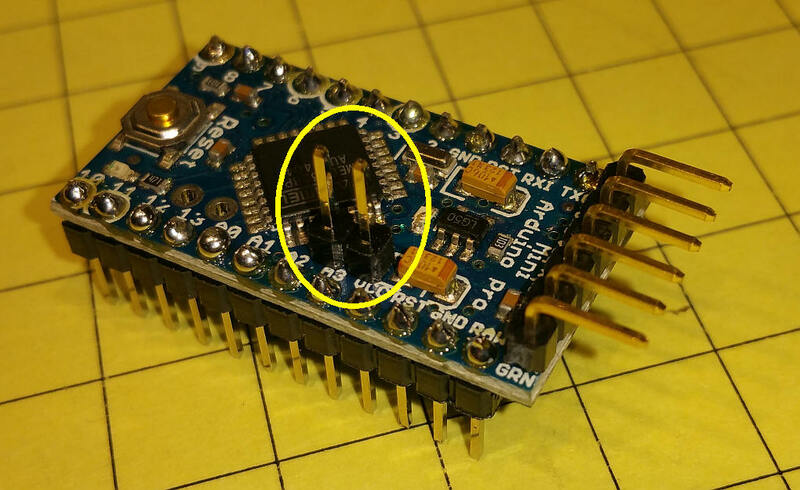 It is circled in yellow and normally connects the 1K resistor to a pin on the Arduino. Here is a closer look at the trace I cut. 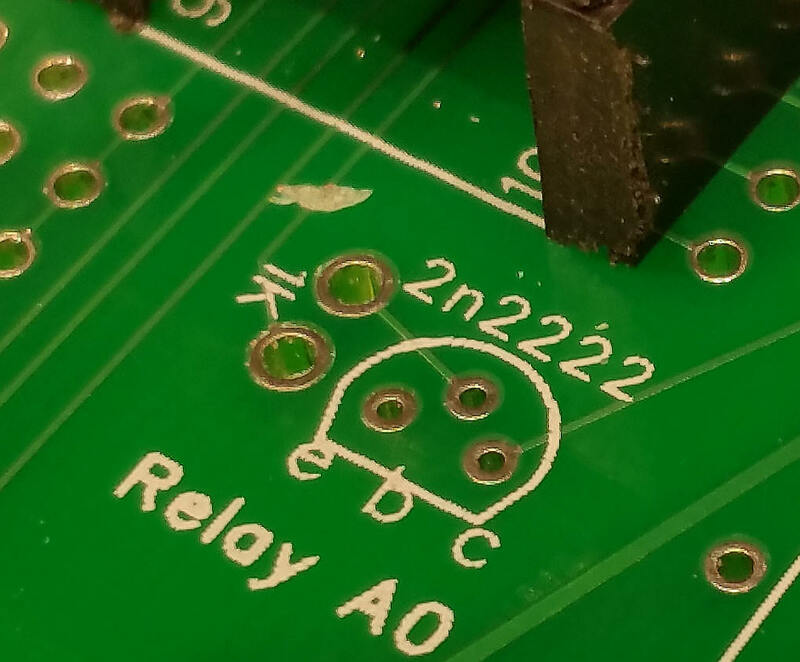 This shows the 2N2222 and two 1K resistors. 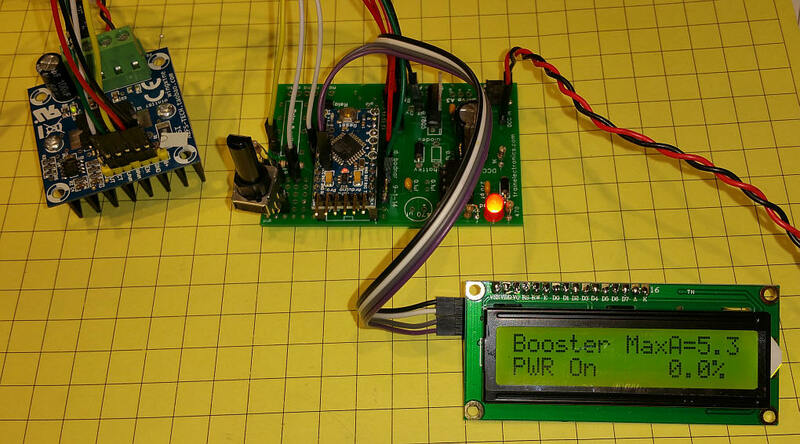 Here the booster is being tested with a 5 amp H-Bridge. 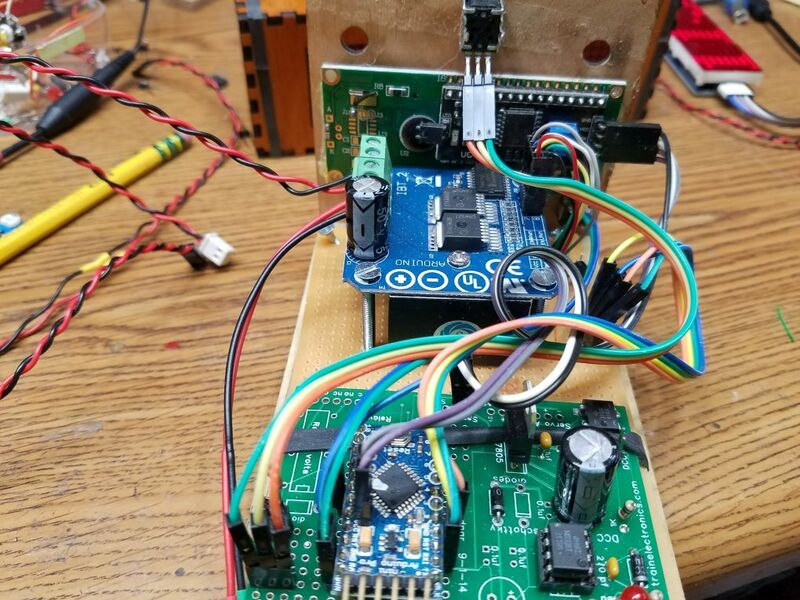 The software for the Arduino has several purposes. As mentioned earlier it can shut down the H-Bridge should a short circuit be detected. In addition a high current limit, say 5 or 7 amps, can be set. Once this is established it can give a percentage of that current that is being used. It can also shut down the H-Bridge should this limit be exceeded. The current limit is set with the potentiometer connected to pin A1 and the information on the H-Bridge's status is displayed on a 2 line x 16 character LCD display. The green LED seen here shows when the H-bridge is on line. 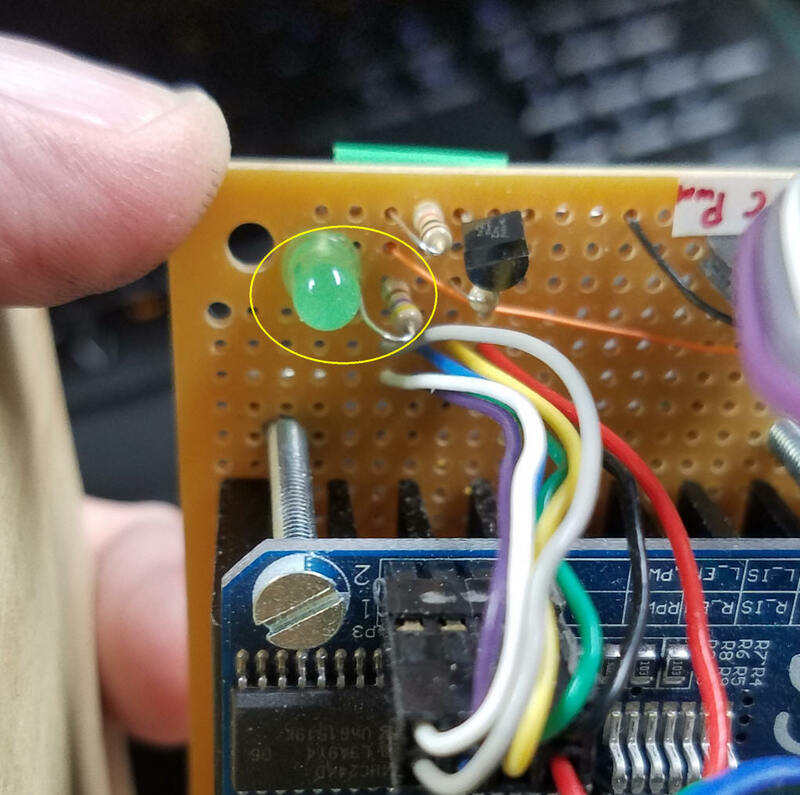 To add it all you need is the LED and a 470 ohm resistor, both shown here in the yellow circle. The negative lead to the LED (the cathode) goes to ground and the positive lead (the anode) goes to a 470 ohm resistor. 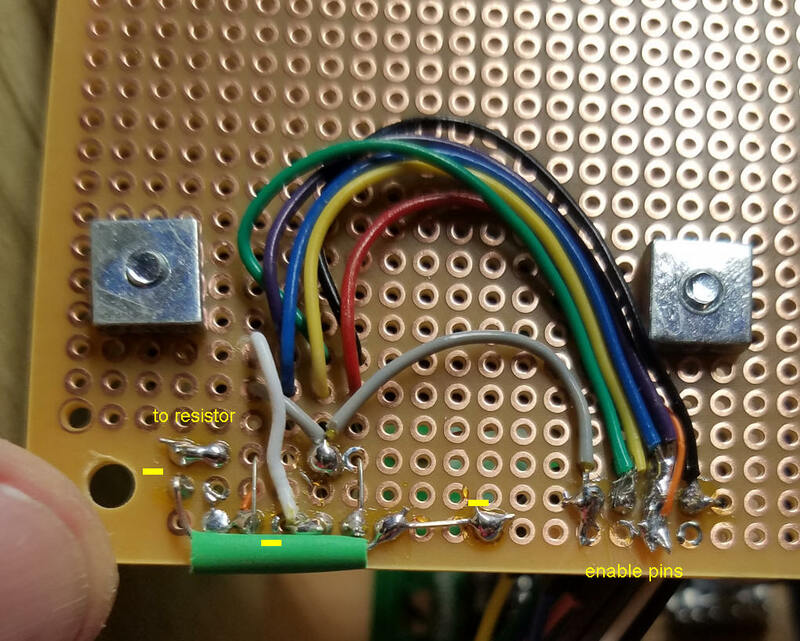 The other resistor lead goes to the enable pins on the H-bridge by way of the orange wire seen here. 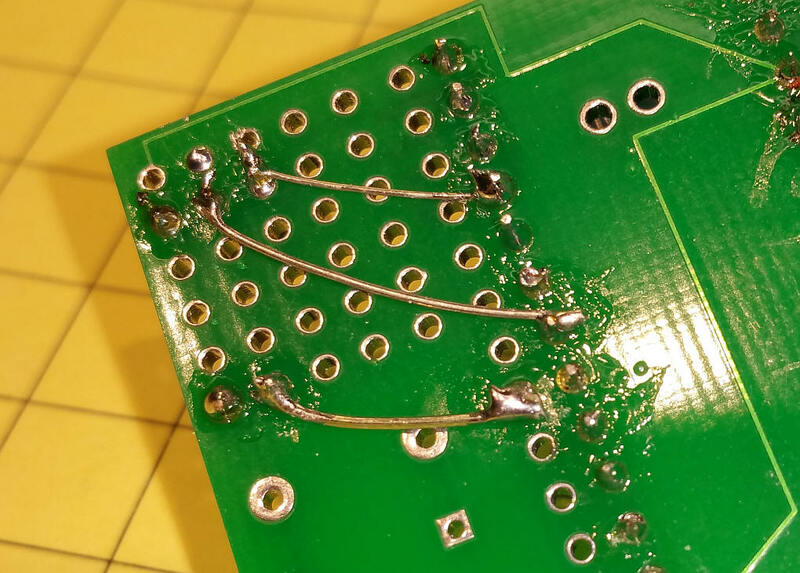 The connections under the board as I wired it are shown here. The enable pins are the purple and blue wires to the right - if you look carefully you can see the thin orange wire that connects them to the resistor.